Whether it’s controlling your household lights, operating a smart lock, or rolling a digital die (try it yourself with “Hey Google, roll a die.”), the Google Home has you covered. But what good is having control of household gadgets without the gadgets themselves? Here, we’ve gathered the best Google Home accessories money can buy so you can get the most out of your device. Note: These products should all work with the Google Home Mini, Max, and Hub too, if you have one of those versions of the smart speaker. Furthermore these accessories should work with most 3rd party Google Assistant devices as well. The best Google Home accessory is also a Google product: the Chromecast. This comes in three versions, the regular model and its 4K counterpart (Chromecast Ultra) for TV, and the Chromecast Audio for speakers. If you own a Google Home and are looking for a low-cost way to improve another part of your home setup, these are a must. The Chromecast and Chromecast Ultra can be connected via HDMI to your TV to expand its functionality. This will allow you to search for movies, TV shows, and actors; browse and cast content from Chromecast-enabled apps like YouTube; play, pause, and change the volume of music you’re streaming; and more, all with the power of your voice. To make the most of this, you will probably want to subscribe to a service like Netflix, Spotify, Google Play Music or similar, though it’s not essential. Meanwhile, the Chromecast Audio can revive a presumed-dead speaker system with similar smart functionality and Wi-Fi audio streaming. Sadly, this is being discontinued as more speakers arrive with built-in Chromecasts, so you’ll have to snap one up soon if you’d like one (they’re down to $15 and they’re already sold out in the U.S. Google Store). We previously recommended the Nest’s third-generation learning thermostat as the best Google Home smart thermostat, but this cheaper, lighter version has now claimed the title. It comes with a couple of compromises, but they’re small caveats to save the $80 between it and its bigger brother. Nest’s thermostats are great because they learn from user behavior. I adjust the thermostat settings in my apartment several times per day as it warms up and cools down, but the Nest can help reduce this pattern with its intelligent algorithms. Monkey around with the Nest for a couple of weeks, changing its temperature settings periodically as you normally would, and it will become trained to recreate your preferences automatically. And when it does need manual adjustment, you can do so with your voice and the Google Home. By pairing these devices you can ask Google to set your Nest to a specific temperature, raise it or lower by a certain number of degrees, as well as get it to confirm the current temperature in one of your rooms. The Nest Thermostat E has a plastic body rather than the larger, more premium-feeling metal body of the regular device. Its screen also isn’t as impressive — it doesn’t display as much information and it’s harder to see than the main model with its Farsight system. What’s more, it isn’t compatible with quite as many HVAC systems as the 3rd gen Nest model, and there are reports that it takes a little longer to learn your preferences. All of that said, the majority of the functionality is still there in this cheaper, neater package, making it the ideal entry point for your smart thermostat life. For all your smart lighting needs, look no further than the Philips’ Hue bulbs. These come in white or colored versions and you can use them in conjunction with Google Home to turn your lights on and off — as you would expect — or manage the settings of individual lights. You can give your bulbs names such as “living room” or “kitchen” and control them independently, including switching them on or off, brightening or dimming them, and setting the brightness to a specific percentage. 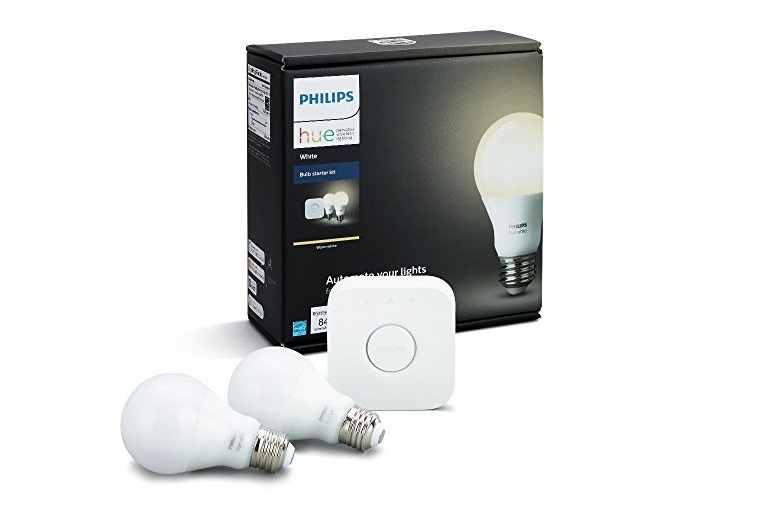 The Philips Hue A19 white starter kit we recommend comes with two white bulbs (which can’t change color) and a hub for $69.99 — possibly the best bang-for-buck you can get when starting out with these. The hub is required to operate these bulbs, but it doesn’t necessarily have to be the Philips unit — others, like Samsung’s SmartThings hub, are also compatible. You can get the more expensive Philips package, with colored bulbs, for $136.47. With these, you can set the bulbs to any colors with the command “turn all the lights [color].” If you’re just starting out and not sure if you’ll take advantage of the multiple colors, I’d save the $60-odd bucks and stick with the white option — you can always add colored bulbs later. For a lighting solution that works without a hub, check out the LIFX bulbs. Note that they’re quite a bit more expensive to buy individually than the Philips bulbs but are still excellent Google Home accessories. One of the easiest and most effective ways to control your home is with a smart plug like the TP-Link HS100. This Wi-Fi-based plug doesn’t require an additional hub to operate and is compatible with the Google Home for operation. You might like: The best smart plugs on the market. Like any good smart plug, the TP-Link HS100 can switch itself on or off using a schedule, and can be operated manually with your voice through the Google Home. The HS100 also has an “Away Mode,” which will switch on your lights periodically when you’re not home to make it look like someone is still around. The TP-Link HS100 is a great starting point for smart plugs because you can start with one and add others later. These can be controlled individually or all together, with help from TP-Links dedicated app, Kasa Smart. The HS100 has similar features as comparable products like the Wemo Mini, but it’s $8 less expensive, and has better reviews. At the time of writing, it has 4.3/5 stars out of 13,500 reviews on Amazon — very impressive considering it’s in a product category that’s known to be problematic (like printers, you’ll struggle to find universally problem free for everyone). The Kasa app itself also has 4.7/5 stars on Google Play after more than 30,000 reviews. A smart hub can be used to connect the various electronics devices in your home together and give you control over them. Samsung’s solution is compatible with a range of products, including those from Honeywell, Netgear, Halo, and Phillips, with more being added all the time. Smart hubs are effectively the brains of your smart home operation and can control multiple products from different brands in one place. Though Samsung’s SmartThings hub comes with its own Android app, you can also control it with your voice through the Google Home, giving you access to lights, security systems, thermostats, and more (so long as you have the compatible products). Samsung’s third-generation model, released last year, has Wi-Fi access its predecessors lacked, and is also a little smaller. This model doesn’t have a battery, though, so if you power cuts you won’t be able to use it. Samsung’s SmartThings hub is getting cheaper and cheaper too: V3 starts at $64.99 while the original from 2014 cost $99. Its additional sensors, like the motion sensor and water leak sensor, are coming down in price too. If you’re buying a new TV set, you should focus on the features you care about most from those and forget about Google Home integration. Why? Because almost any TV system can be used in conjunction with the Google Home if you own one of the aforementioned Chromecasts. These provide a cost-effective way to Google Home-ify your TV and means you don’t have to limit yourself to TVs with “Chromecast built-in” functionality. Just make sure your prospective TV has a spare HDMI port to connect it (the TV should also run at 4K resolution if you wish to take full advantage of the Chromecast Ultra). The same applies to speakers: if they have a 3.5 mm audio input, you can turn them into a smart speaker with the Chromecast Audio. Though the Chromecast Audio is being discontinued, more and mroe speakers (and TVs) are arriving with the Chromecast functionality built in, all of which will work seamlessly with Google Home without an additional accessory. What is your favorite extra for the Google Home? Let us know in the comments.